I get ideas all the time! While driving the kids to school, showering, creating another project, watching TV, sleeping (or at least trying to sleep). I just cannot turn them off. Some are just thoughts that I throw out as soon as they come, but others just will not go away, even if I try. This is one of those ideas! It just kept tickling the back of my brain, every time I had a free minute I thought about it. So I decided it was time to just go for it and see what happened. And it was good! 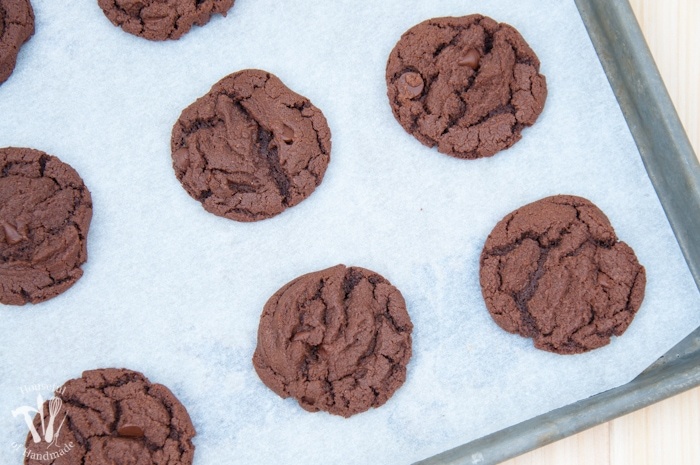 These Double Chocolate Nutella Cookies are the perfect chocolate fix for my late night chocolate cravings (or any time of the day for that matter). Nutella is a pantry staple at our house. Just like sugar and flour, we always have a jar on hand. If I need an instant chocolate fix, I just grab a spoonful of Nutella and call it good 🙂 But sometimes I get really crazy and actually make something extra delicious with it! I really love eating cookies, but it might surprise you that I actually enjoy making cookies even more. There is just something really comforting about baking that makes me happy. It relaxes my soul or something. So after a long day of fighting with the kids, or cleaning the house an endless number of times, making a batch of cookies just ends the day on a high note for me. And today was one of those days. 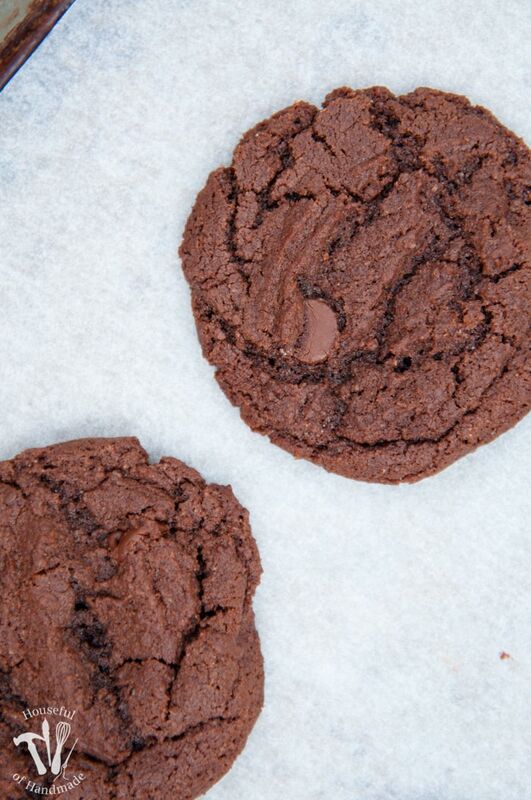 When I make cookies, there are 2 things that I need to make them the perfect cookie for me. 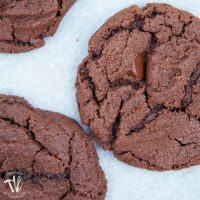 They can be all kinds of fun flavors, but for me they must also have a nice chewy center and cannot require chilling the batter before baking. Now I am not saying a cookie that needs 2-3 hours of chilling before baking are not delicious and worth the wait, but when make cookies, I hate to wait. I don’t want to make my cookies in advance in case I need it in 2-3 hours, and I definitely do not want to wait when I am having one of “those” days. And these Double Chocolate Nutella Cookies did not disappoint. Perfect in every way! 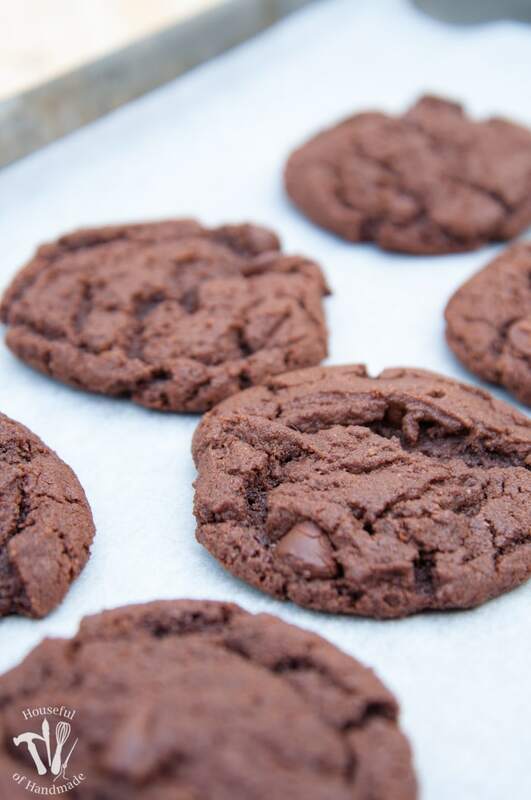 So if you want a soft, delicious, chocolatey cookie right now, you need to try these Double Chocolate Nutella Cookies. They have a little crunch on the outside, with a soft chewy center and packed full of chocolatey, Nutella goodness. Yum! Can't get enough Nutella? Or chocolate? 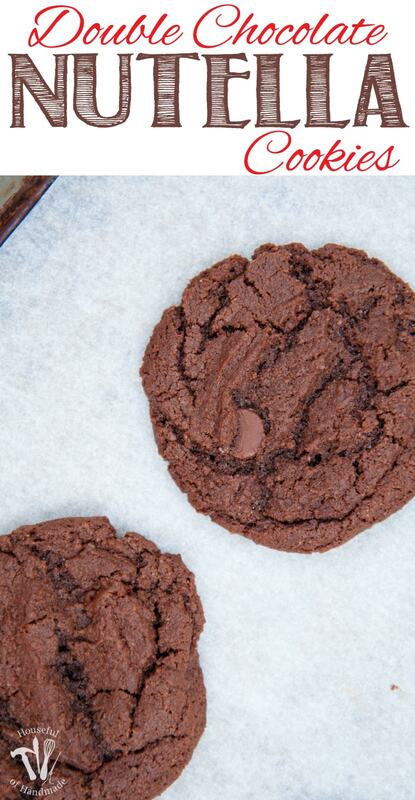 These Double Chocolate Nutella Cookies are the best cookies for your chocolate cravings. And the dough doesn't need to be chilled before baking! Cream together Nutella, butter, and sugars until light and fluffy (about 3 minutes). Add 1 cup flour, cocoa powder, baking soda and salt. Mix until combined. If dough is too soft, add in up to another 1/4 cup flour. 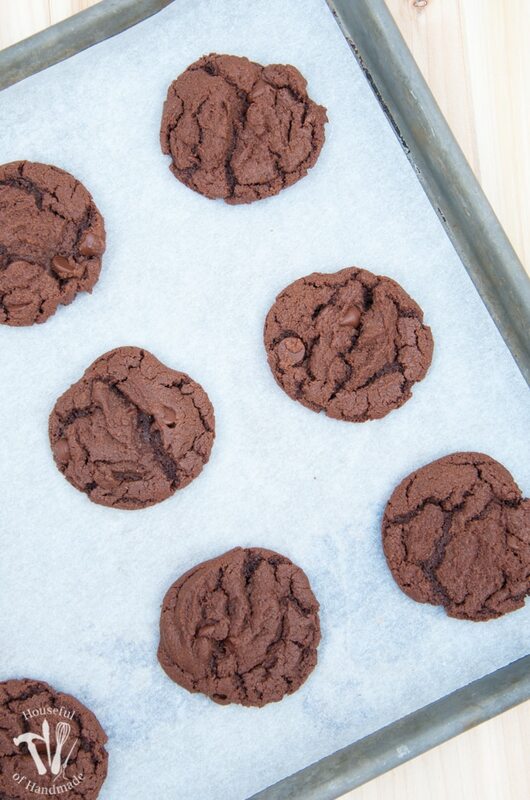 Scoop 1 Tbsp mounds onto parchment lined baking sheet and bake for 9 minutes. Remove from oven and let cookies sit on baking sheet 2 minutes before moving to cooling rack to cool. 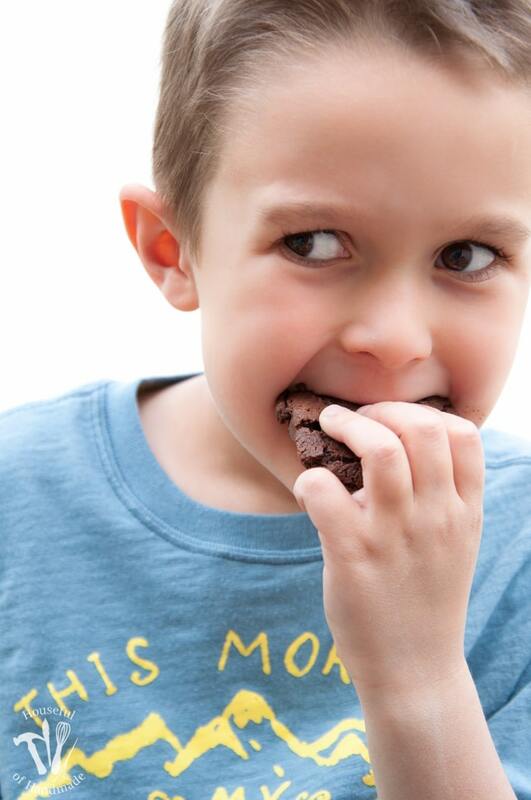 Now I am finally ready to call an end to this day and start fresh tomorrow… with a cookie in hand! How much baking soda?😬. I don’t see it listed as an ingredient with a quantity. Any help appreciated🙂. I’m making them now!!! It’s 1 tsp. The recipe it updated now. Thanks so much for letting me know! Yummmm!! These sound amazing! And I’m totally the same way – constantly thinking of new home decorating ideas, crafts, etc! Thanks for linking up with Merry Monday this week. Anything with Nutella is perfect in my book. And she was definitely enjoying her cookies!